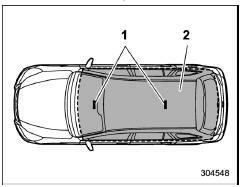 If the access key is not detected within the operating range of the antennas inside the vehicle, the pushbutton ignition switch and the engine start cannot be operated. Do not leave the access key in the following places. It may become impossible to operate the push-button ignition switch and the engine start. It may also cause a false warning to issue although no malfunction actually occurs, or not to issue a warning when any malfunction occurs. When operating the push-button ignition switch or starting the engine, if the access key battery is discharged, perform the procedure described in "Access key - if access key does not operate properly" 9-17. In such a case, replace the battery immediately.